Magnet Commerce works together with StatCounter.com and Google Analytics, to help you analyse and monitor all visitors to your website in real-time. 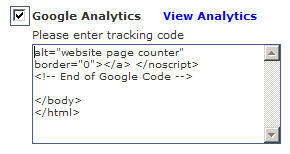 It also lets you add your own html tracking code for getting specific web statistics you are interested in. Figure: Access the Web Site Statistics page by choosing "Reports > Web Site Statistics" in the Administration Panel. In the "Web Site Statistics" page you can enable StatCounter, Google Analytics and add an html tracking code of your choice to get web statistics for your online store. Click "Save" to save any changes you make on these settings. StatCounter offers a plethora of various webstats. You can get a breakdown of your current unique, returning and repeat visitors over the lifetime of your website. It also offers browser, resolution, operating system, country, search engine, keyword, referring link, drill down and magnify visitor analysis and reporting. Setup StatCounter on your Magnet Commerce store. Go to your "Reports > Web Site Statistics" tab in the Administration panel and tick the "StatCounter" check box. Once you tick the box, the "Edit Settings" and "View Statistics" links will appear. Click on "Edit Settings" to add your StatCounter account settings. Figure: To use StatCounter statistics for your online store tick the "StatCounter" check box and click "Edit Settings" to add your StatCounter account settings. The "Edit Settings" link gives a pop up window with fields for adding your Username, Password and Statcounter Tracking Code. Add this info and click "Save & Close" to permanently save them. Figure: Add your Username, Password and Statcounter Tracking Code and click "Save & Close" to permanently save them. Any time you want to check your website statistics using StatCounter, simply click on "View Statistics". 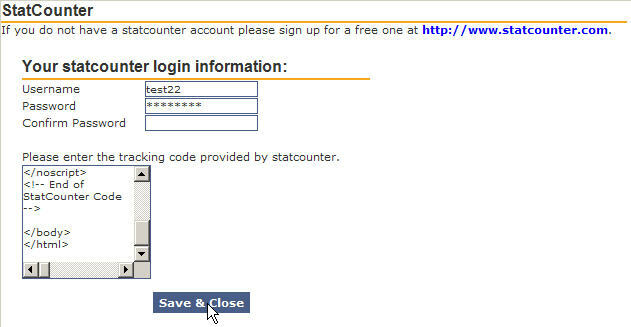 You will automatically login to your StatCounter account and access all available information. Setup Google Analytics on your Magnet Commerce store. Figure: To use Google Analytics on your online store tick the ""Google Analytics" check box and enter the tracking code in the box provided. Any time you want to check your website statistics using Google Analytics, simply click on "View Analytics". You will automatically login to your StatCounter account and access all available information. Figure: View website statistics using Google Analytics. With Magnet Commerce you also have the option of adding an html tracking code of your choice to your store pages. This will allow you to get specific web statistics you are interested in. Figure: To add custom tracking code to your store pages tick the "Custom" check box and enter the tracking code in the box provided. Select the "Reports > Web Site Statistics" tab to get statistic reports for your website. You can enable StatCounter, Google Analytics and add an html tracking code of your choice to get web statistics for your online store. Once you have finished setting up you web statistics click "Save" to save your settings.